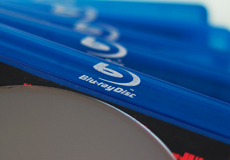 According to the Blu-ray Disc Association, the announcement of a next-generation Blu-ray Disc compatible with Ultra HD is imminent, putting to rest concerns of a potential 4K format war. During the IFA conference in Berlin, Marty Gordon, VP for Alliances & Communications at Philips and spokesman for the BDA, said that an announcement regarding an enhanced Blu-ray format involving a traditional-looking disc is expected in the near future. “The BDA’s task force has been working feverishly and we expect an announcement soon — I hope this year,” explained Gordon. “It will be an optical disc, but I can’t comment on any of the specs,” he said, adding that the 300GB format Panasonic and Sony are reportedly developing is separate from Blu-ray and not part of the same initiative. Recently there has been speculation regarding an impending 4K format war, similar to what played out with VHS v. Betamax and Blu-ray v. HD DVD.